Otherwise known as Anchor Chain. 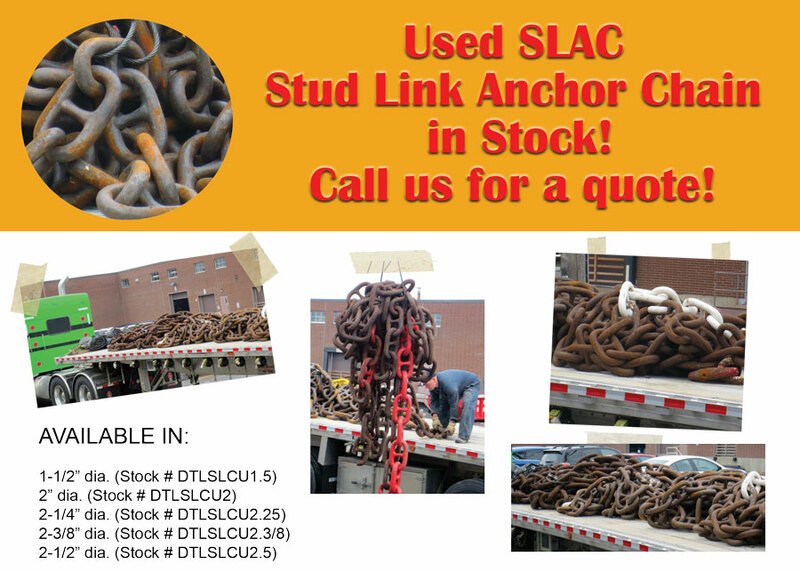 Stud Link Anchor Chain is the strongest type of chain available that comes with full traceability. If you are buying SLAC for your commercial marine (ship / barge / platform), one of the most important determining factors is what "Type Approval" does your insurance company or ship owner require. To maintain your insurance, you need to buy chain that is approved by the appropriate maritime certification agency. The oldest, most common, for large ships tranporting goods across international boundaries is Lloyd's. Depending on the water the ship sails, there are regional marine agencies like American Bureau of Shipping (ABS) or many others. 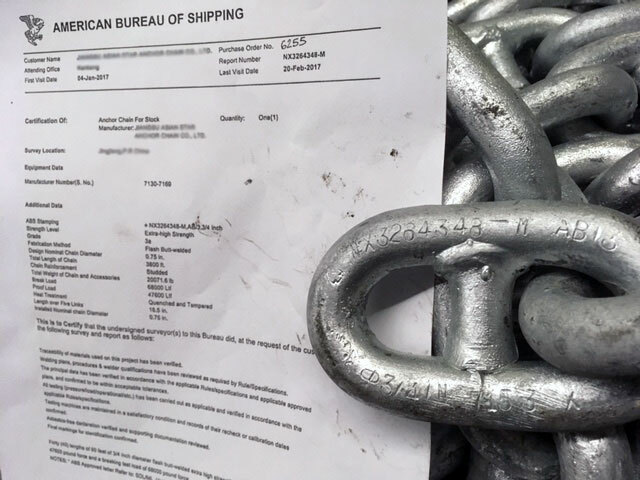 Any commercial marine vessel operating in North America will require either Lloyds or ABS approvals for their anchor chain and everything that it connects to. "Type Approvals" are usually required on *ALL* parts of anchoring a vessel. Anchor, Shackles, Chain, and Swivel as a minimum. Anchor Chain in Canada and USA is available with either Lloyds or ABS approvals. The certification adds a considerabe cost to manufacturing. Lloyds approval, as the ultimate "Gold Standard", is generaly slightly more expensive than ABS or other other regional or national maritime certification authorities. For a commercial maritime vessel, chain grade like Grade 30, Grade 80, Grade 100 are *NOT APPROPRIATE*. Grade 80 and Grade 100 might be approved for overhead lifting, but that's a whole different situation than anchoring a commercial vessel in the open ocean. Offfshore Oil Platforms usually require ORQ. This is the strongest chain grade available. There is nothing stronger.